Maybe it’s just me. But once I do something one time, it’s really hard to make another identical one! I’m ready to move on, so mass production is especially hard for me. But I need a LOT of Christmas cards – I send out about 200 each year, 50 or so to family, and the rest to Patrons, random subscribers here on the blog, and students. So I need to learn how to make a bunh, and found a way that at least won’t bore me to tears! Watch the video below or click HERE to see it in HD on YouTube. Kinda fun eh? Mix up the papers and mediums and stamps and at least there’s some difference for you to enjoy, too! 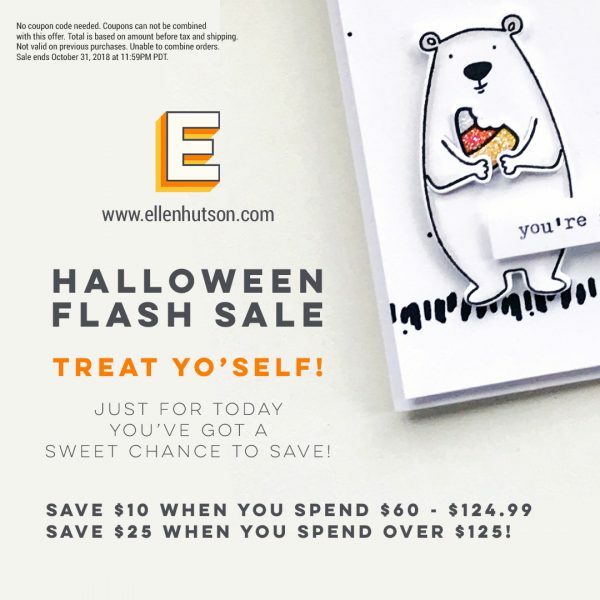 If you need any goodies to keep from being bored…..there’s a sale for ya HERE! The little grid below shows some of the stamps coming up if you need ideas, in addition to the actual supplies for this card below that! 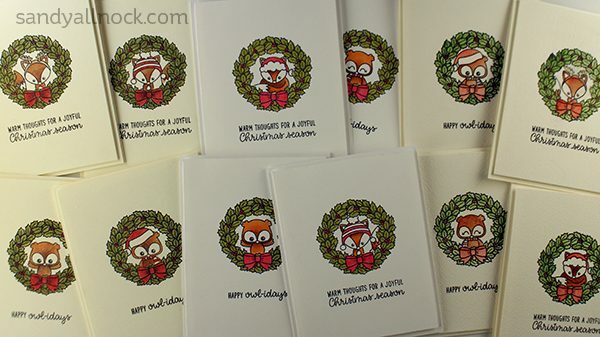 The cards are adorable and I think anyone would be thrilled to receive one of your cards. It is kind that you send to others outside of family and close friends. I also am surprised that water coloring is faster! These are darling. Your quick coloring looks great to me. I usually have fifty to sixty cards done by now, but this year I only have about twenty-four. Maybe I had better drag out the watercolors! lol. Thank you for the video. Dang! Mass production! Go girl! You know I love me some mass production. These cards are cute, and you’ve got some uniqueness going on. Please if you have a chance please tell me about the Stonehenge paper. I have a ton of PrismaColor pencils and I like to use Gamsol but I’m never pleased with the results. Does this paper produce a better result? Does the pigment move easier? I loved this stamp set too and never thought of mass producing with it….mass producing bores me, but you make it look so easy. Thank you! What a great video ! Very cute cards , and I love the tips because I too get quickly bored ! Adorable cards!!!! Unfortunately, I don’t even have 10 Thanksgiving cards totally finished, much less any Christmas cards! However, I just received a stamp I ordered for the Christmas cards and now I can get started! Thanks for sharing these cards – I love them! 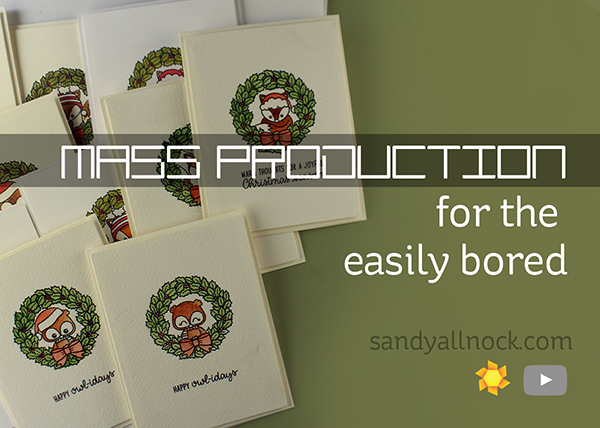 Sweet little cards – and they do look easy to mass produce. I don’t need to make but a quarter of what you’re doing, and I’m running behind schedule, so I may have to resort to your solution. I’m sorry your family doesn’t appreciate what you do, tho. Do they think you make cards in order to save money? My family does – what a laugh! We do this because we love doing it, right? Thanks once more for all you do! These are very cute, and a reminder to me that I have to get my production line going too!